Initially created for a day workshop at a local craft shop, this project was designed for crafters that had never made a foto folio before. As a result of the feedback and following numerous requests, I have videoed the tutorial for everyone who wants to have a go. Judging by the feedback, you’ll love it!! Here it is at last – as promised, another foto folio project to enjoy! Quick and easy to make, you will be able to complete this entire project in as little as a day. With Step by Step Video Tutorials and PDF Instructions too, as with the other 4, you will find completing this project very easy to do. 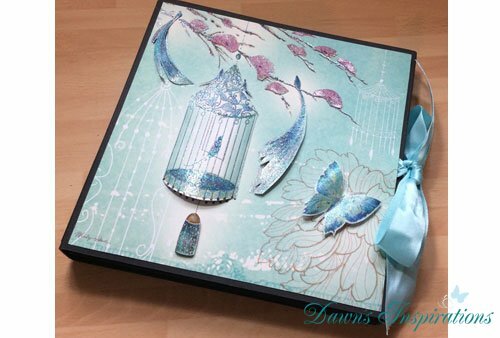 Thanks for a fantastic workshop – it holds soooooooo many photos and hopefully I can make many more scrapbooks like this. I have learnt loads today, thank you! Always enjoy your workshops, Dawn. Had so much fun creating this project. Thanks to Dawn for your tuition and great project. Looking forward to the next one! Dawn, l left a very good comment on utube (hope you think so). I found the tutorial fantastic and I really enjoyed making the album. Just loved how strong the album was. Thank you for you message on my YouTube a Channel and also here. As you are a new crafter it is great to hear that you have found my Onlone Workshop not only easy to follower but you are delighted with the results of your project.